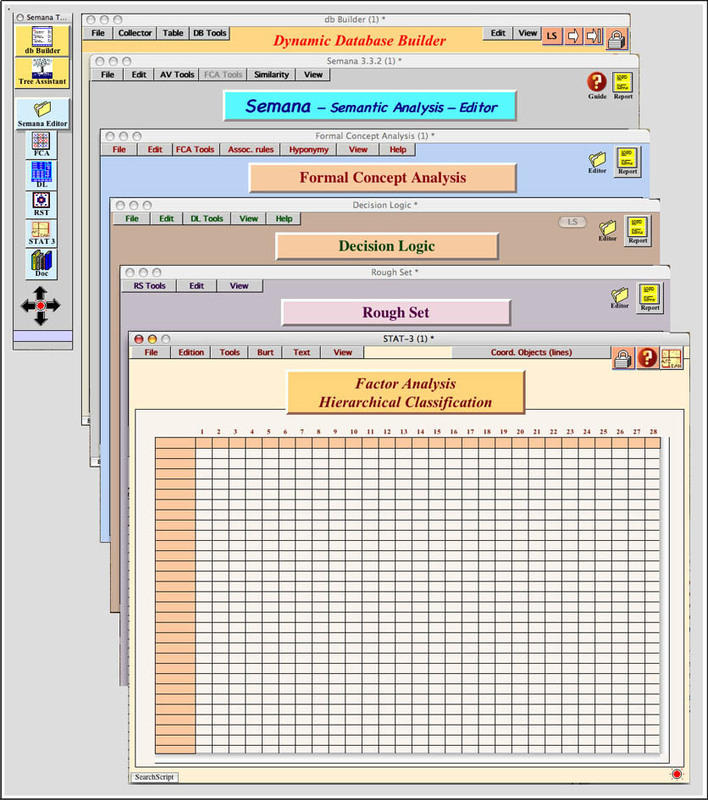 WHAT IS THE SEMANA SOFTWARE SUITE ? SEMANA is a software written in Transcript®, the programming language of LiveCode®. It is aimed at facilitating the interoperability of procedures useful for Semantic Analysis and, more generally, for Knowledge Discovery in Data Bases. Compiled versions may be used on MacOS X, Windows and Linux. The software is presently available for Apple MacOS X and MS Windows. 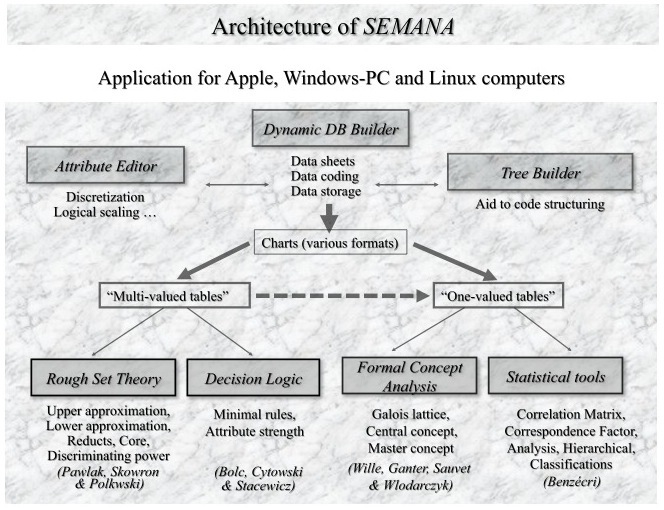 assistance to attribute and values edition, tree-structure visualization, transformation of multi-valued tables into one-valued tables, nominal and logical scaling procedures, discretization of quantitative variables, clarification of objects and attributes, co-occurrence tables (Burt's tables), etc. lower and upper approximations, reducts, core, discrimination power. determination of minimal rules (for given subsets of conditional and decisional subsets of attributes), detection of inconsistencies. graphical representation of lattices, alpha-Galois lattices. 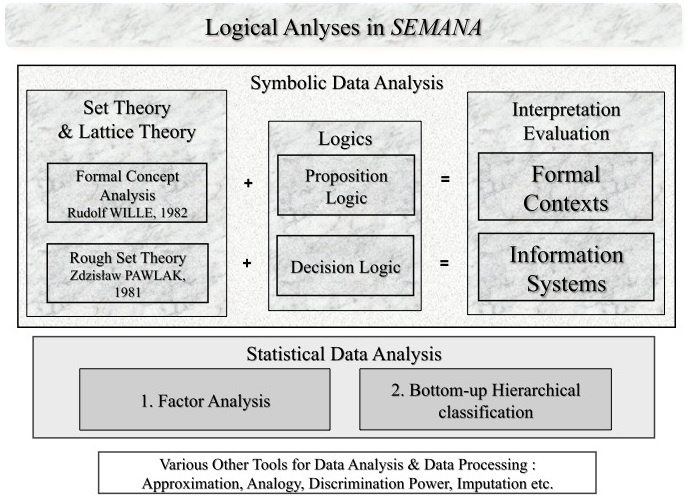 including Correspondence Factor Analysis and Bottom-Up Hierarchical Classification (according to Benzecri programs) and classical statistics such as correlation matrices, similarity indices, feature matching, cluster coefficient, etc.